No MLS head coach has won more games (254, including playoffs) than Sigi Schmid. After winning three collegiate titles during a long stint (1980-99) at UCLA, he won MLS Cup crowns with the Galaxy (2002) and Crew (2008) prior to joining the expansion Seattle Sounders in 2009 and reeling off seven straight playoff appearances prior to his dismissal in July 2016. Schmid, 64, returned to the Galaxy last season to replace Curt Onalfo and finished out the worst season in team history: 18 losses and 67 goals conceded. The team has returned from Tucson to continue preseason training at StubHub Center. SOCCER AMERICA: Just about everything went wrong last year. Lots of key injuries, younger players who didn’t come through, and a big dropoff for Giovani dos Santos after a good debut season in MLS. What did you see as the main problems? SIGI SCHMID: It was hard for the team last year to get into any kind of flow. With the changes, with the injuries, and then more injuries, it was just tough. When I came in and took over the team, we lost 75 percent of our defense within four weeks. We had a carousel in goal a little bit, which is not ideal. That makes it tougher to build consistently out of the back and find Gio where he needs to find the ball. That forced him at times to come deeper for the ball and that takes from his effectiveness. SA: You mentioned the carousel in goal, which is one position you’ve revamped. Can you give us a quick rundown of what you expect from the players you have added? SIGI SCHMID: We wanted to strengthen ourselves in certain positions. One, for sure, was goalkeeper, so with the addition of David Bingham we’re confident he can rebound to the form that he had. I know last year was a tough year for him for a number of reasons. Bringing in Jorgen Skjelvik gives us a defender who has very good pace. He’s a very good passer of the ball out of the back, which helps us. Rolf [Feltscher] is a guy who’s played outside back at the international level in a lot of different countries. He’s a very good lockdown defender so hopefully he adds things. Perry Kitchen is a player who loves to talk, loves to organize, which is something I felt we needed in the midfield. And obviously Ola Kamara is someone who has shown he can score goals in this league. SA: Midfielder Sebastian Lletget hasn’t played a competitive match since he suffered a severe Lisfanc injury playing for the USA last March. How is he progressing and will he be ready for the first game of the season? SIGI SCHMID: We’ve got to be real careful with Sebastian. He’s doing fine. There have been no setbacks, his training regimen has gone good. We’ve just got to make sure we don’t push too hard, too early because he was out for a long time. He’s a vital player to our team. It’s like adding a new player with him coming in. By opening day is he starting, is he coming off the bench? Probably more coming off the bench but slowly building into it. We’ve been monitoring his daily activities pretty closely. SA: Despite the team’s record last year, Romain Alessandrini (photo) lit it up as one of the league’s top newcomers. You didn’t coach against him when you were in Seattle. With a year of MLS experience what can he attain this year? 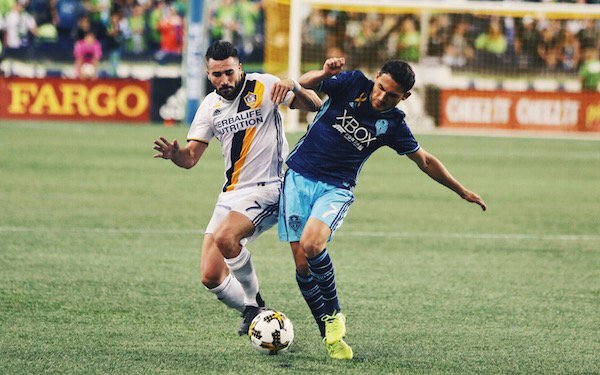 SIGI SCHMID: We expect Roman to be just as impactful as last year and to have some better options as well all around him. We’re really happy with him. He came in extremely fit and ready to go. That shows his level of dedication. He wants to have another outstanding season. It was a very positive thing for him and the club in every regard. He’s a unique player. He’s got this great skill set. There are other players in this league who are dribblers but there’s times where he gets through situations that you just shake your head and you can’t believe he what he did. SA: You mentioned the injuries and other factors that impaired the team’s attempts to set tempo and consistency. How do you want this team to play? SIGI SCHMID: Right now, we’re just working on all the new players getting to understand each other and read each other and know what they can do for each other. We want to be a team that can play out of the back, build out of the back, and have a possession style. Last year there were times when we completed passes but they weren’t the best option. We’re working on that as a team so we find better options: find Giovani, find Roman, find Kamara, find Jonathan dos Santos. Find those players in better positions. SA: Last year you hired former Quakes head coach Dominic Kinnear as an assistant, and you’ve also brought in Ezra Hendrickson, who had been coaching the Sounders’ USL team. How are you dividing up responsibilities? SIGI SCHMID: My belief is that you hire good coaches and you don’t worry so much about their areas of expertise. It’s a question of whether it’s something they want to do. Dom was in a situation obviously where things had changed for him in San Jose so he and I talked and thought about it a little bit and at first I was just looking for him to come on board and help get us through the season but he decided he wanted to stay. We’re very happy that he did. SA: What is a direct advantage of having so much playing experience and coaching background on your staff? SIGI SCHMID: It allows us to concentrate on aspects of our game. We like to break it down a little more. Obviously, we have Oka [Nikolov] for the goalkeepers. We have somebody for defenders, somebody for the midfielders, and somebody for the forwards. We like to split it up. It’s helpful. You’re breaking down more video, you’re putting guys in smaller groups to look at the video, so you’re doing a lot of those things positionally. There’s a lot more input than their used to be in terms of sports-performance data that’s available and using video to push more information out to the players. It has something that’s changed dramatically over the years. SA: The Sounders have been one of the league’s most innovative teams in the area of sports science and performance analysis. Have you adopted some of those principles? SIGI SCHMID: We’re moving in that direction as well. Pierre Barrieu came on board [as director of sports performance] right before I did and we’re very happy with Pierre. He was able to hire two people this year that he wanted so he can grow and expand that area. SA: It’s likely both of the dos Santos brothers will miss about two months of the season to play for Mexico at the World Cup. How do you fill those holes? SIGI SCHMID: That’s a period that’s going to be tough for us. One of the big areas of improvement for our club is the depth. That will help us in that period of time when they’re gone. Jonathan has been great. He was the most fit player coming into camp. As he showed with his assist [in a preseason game], he’s playing well. With Giovani, as [Mexico head coach] Juan Carlos Osorio said, it’s the best offseason he’s ever had. He’s really prepared to go. SA: You’ve worked as a coach in this country for nearly four decades and twice coached the U.S. U-20 team. Failure to qualify for the World Cup has triggered a firestorm of criticism and suggested changes. What you see as the major issues to be resolved? SIGI SCHMID: Certainly not getting there is cause for reflection and to re-look at everything we’re doing. But that should be just a normal process: reflecting upon our development system of our players and how we’re pushing players on, that should be done on yearly or at least bi-yearly basis. Not qualifying accelerated everybody’s focus on that. For me, the one area is just the player identification process. I think sometimes we drift into categorical evaluations. There was certainly a period of time under past coaches -- I’m going back 25, 30 years to when bigger, stronger, faster is what we needed -- and maybe now we’ve gone too far in the other direction. The claim is that, ‘[Lionel] Messi wouldn’t have developed in the U.S.’ Well, the question is also would [Paul] Pogba have developed in the U.S. because at 14 or 15, he was probably not real silky smooth. There’s both aspects. Player identification is an important aspect in terms of our player development system. A player who was big and strong and maybe not as smooth with the ball. Would he have been bypassed? You can’t bypass either. You can’t miss Messi and you can’t miss Pogba, so our player identification process needs to identify both sides of the coin. But there are a lot of factors that enter into it. The presidential election, I’m not voting, so I don’t have anything to say. I know it’s a pretty complicated voting process and we’ll see what comes out of it in the end. SA: The federation acknowledges it needs to get into communities far off the beaten track to expand its player searches. Are you also saying the players who are seen aren’t being evaluated properly? SIGI SCHMID: Everybody’s eyes are different and without a doubt some people are better at it. Can you identify everybody? No. But I think [U-20 head coach] Tab [Ramos] is probably right now working hard to establish a player identification model that points out what he wants coaches and scouts to be looking for. We want to improve our selection process. What people or scouts see is always a variable question. You might have five coaches look at the same player and get five different answers. SA: While you were at UCLA you said if a player couldn’t contribute as a freshman he probably wasn’t going to be good enough down the line. That may seem a harsh standard but it seems to have worked pretty well. SIGI SCHMID: That’s always been my philosophy. I have to see something in a player so he can help me now. The other thing is I feel players have to have a special quality, something that sets him apart. I think sometimes in our player development system we spend a lot of time trying to improve a player’s weakness and forget about making a strong area into a super-strength. We need to improve strong areas so we have players who are exceptional dribblers, exceptional headers of the ball, exceptional one-on-one defenders, exceptional passers, exceptional finishers. You’ve got to hone in on that and get people to grow the areas they’re already very good at. SA: For quite a while Eric Wynalda, among others, has criticized a coaching philosophy that values all-around players at the expense of specialists. SIGI SCHMID: That definitely happens. Sometimes I look at wide players and they can’t cross the ball. If you’re a wide player, you’ve got to be able to cross the ball a little bit. It’s still part of the game. We build more and we play more through the middle than we ever have and I understand that, but players still need to do both. The main thing is to identify a player’s strength, and to grow it, just as Eric said. SA: As a native of Germany who knows the soccer system well, what are the key components of player development in that country? SIGI SCHMID: The scouting and player identification is a big part of it. The other thing that happened in Germany is the federation invested real money into their regional coaching staffs. The size of the country is much smaller, so the opportunity to bring players into a regional training camp on a consistent basis is much greater. Our country is much bigger so it poses unique problems. I don’t think we’ve ever truly addressed how we can get our top players into a regional situation so, at the very least, we’re getting them 40 to 50 days [per year] with the coaches who are trying to evaluate and grow their talent within the national-team program. We went to Bradenton, which was really for a select few, and we missed out on a big part of the population. Now that Bradenton’s over, do we use some of that money to build regional training centers? Probably not. That’s a huge investment. But there are so many collegiate facilities you could rent it every third or fourth week to run a regional camp. It’s an investment that needs to come from U.S. Soccer. It’s a re-think as to how we can touch these players more often. SA: In many countries, professional teams take the time and expense to find and scout players. Is MLS catching up in this aspect of the game? SIGI SCHMID: My first time around with the Galaxy a lot of times I was the guy who found the player and scouted the player. Now you just can’t afford to do that. 17 comments about "Sigi Schmid: 'If you don't so self-assessments, you're never going to move forward'". frank schoon, February 7, 2018 at 10:25 a.m.
<We want to be a team that can play out of the back, build out of the back, and have a possession style. "> Yeah, and I wanna see Santa Claus do a back flip..
Talk is cheap. I hear this all the time from coaches, telling their players "we need to possession style soccer". If their is one country that has no ability, no history, no culture of coaches that has the ability to play possession style and building up from the back it is the US. Our soccer culture ,even today, unfortunately is so British/German, that lack possession/ build up style, influence from the past 50years. There is not one Coach from the USSF coaching academy that has ever played at a high level, possession style soccer, that can teach this finer aspect of the game; but I"m sure they'll able to teach it employing flip charts, blackboards, magnetic boards and cones. I think if Sigi wants to play real possession style/ build up, is hire someone who is retired and played at a high level possession style soccer, who can specialize in this aspect of the game. To play this type of game then you have to the RIGHT players ,able to handle the ball under pressure, and goalie as well, for he needs to be able handle the ball with his feet(which is a rarity,here),good in ball placement, and able to see the options( does any goalie in the MLS qualify). Sigi is right on this. There is not a flank player in the league that has decent crossing ability. I've seen so many crosses that end up behind the goal and if it weren't for the backstop most of the balls from these crosses would end up in the parking lot underneath the cars. In other the players have kicking/passing/crossing techniques, having no ability to place the ball. Then you have to ask yourself where is the DA program on this..aren't they suppose have taught this important technical aspect to the youth... after all these years, you have paid so much money for this pay to play garbage. The cross is on the greatest offensive threat, for: ONE, it forces the defenders to turn their backs to their opponents: TWO, forces the defenders to choose either to watch the ball or their attacker: THREE, the cross which bends away from the goalie, forces the goalie to choose to either stay or come out of the goal for the ball: FOUR, the cross, bending away, forces the defensive line to be in a off ballance position for the ball will end going into opposite direction of the path of the defenders who moving towards the goal. NEXT POST. frank schoon, February 7, 2018 at 10:56 a.m. This is why Cruyff states that he prefers real players that can really demonstrate to the youth the HOW TO'S besides youth players respect coaches who can demonstrate techniques. Cruyff stated that this is one of the problems which has hurt soccer for the coaching license system allows licensed coaches without the ability to really demonstrate the various technical abilities to develop youth. What is so important about those bend away crosses is that ,today, the outside backs are not defensively ready to counter it because today most flank players cut inside and if they don't cut inside a it usually is a lousy cross anyway. A smart coach should take that advantage by playing an attacking type of game that forces the opponent's outside backs to do those things they are not used to doing any longer . But today all teams play the similar attacking style thus making it easier for the defensive to know what to expect. Bob Ashpole, February 7, 2018 at 11:43 a.m.
Frank, I suspect that you are venting at the wrong coach. The problem I see is not the coaches, but rather the owners. The owners have to be committed to playing that style or else they will fire the coaches for losing matches. The return-on-investment is in the future. How many would accept a losing season to learn a new style of play? I have seen adult amateur teams play possession style, mostly ethnic teams playing old school Latin style years ago. I even saw one team that made a fair immitation of Barca, although it was based on a pattern. But I guess that is a problem, most of us don't understand possession style play at a high level. I have always hated the phrase "building out of the back." Most of us have a superficial view of Barca Tiki-taka and Ajax total soccer, not an understanding of the substance. Even in the soccer mad countries, most teams do not play the quality soccer of their top teams. My understanding is that some college programs, at least on the women's side, play possession style. But it isn't widespread, and I am unaware of any at a higher level. frank schoon replied, February 7, 2018 at 11:52 a.m.
Bob, owners don't know anything about soccer...they want to win, BOTTOM LINE and they don't care how that is done. All teams in the MLS basically play the same, attacking outside backs, flank players cutting in,etc ,etc. So it is within that framework all teams play. Owners don't care about that...it's winning games. frank schoon, February 7, 2018 at 11:44 a.m.
<we spend a lot of time trying to improve a player’s weakness and forget about making a strong area into a super-strength"> Again ,I disagree. Rinus Michels in his practices always had the intent of improving the weaknesses of players. Obviously you don't force players to run faster if that is not their style. But Ruud Krol who played with Cruyff as a right footed leftback spend 30min after practice learning to cross the ball with his left which produced the second goal against Brazil in WC'74 scored by Cruyff. Cruyff didn't have a strong left footed cross so he learned to use the outside with his right thus allowing for the same effect on the ball in the cross as a leftfoot. R2 Dad, February 7, 2018 at 3:07 p.m. Thanks, Ridge, for bringing this interview. "What people or scouts see is always a variable question. You might have five coaches look at the same player and get five different answers." We know the issue of scouting standards is a problem because the output has been, on the whole, so dire. This reminds me of the chapter in MoneyBall where Billy Beane sits around listening to his scouts go on about players having the right body, the right mechanics, with no numbers to back them up. There are no quantitative stats to assist scouts in identifying performers, but maybe we can start with soccer IQ and vision. Right now it's the last thing coaches think to measure but if we made it one of the first we could much more effectively filter out the pretenders. It's like our scouts are still stuck in the 90's with big/tall/fast kickball players and our game should have moved on by now. We should be asking ourselves, Who are the scouts? Who is responsible for choosing the scouts? What are the criteria used to rank players? This should be transparent and rational, but it isn't any more transparent than the Nats coaching silo and those that control it. Right Winger, February 7, 2018 at 4:02 p.m.
Schmid's comments about Messi and Pogba and the fact that player identification is an important part of a player development system. It sure isn't part of our DA development system and that has been proven over and over. We have players coming into NT camps because they were identified as top talent by our scouts just to be turned away and out to pasture because the NT coaches didn't have the wear with all to identify them and they are sent home and then all of a sudden they show up in some foreign country playing well. Technical players are out because they touch the ball too many times and don't kick it far enough down the field so the big fast guys can chase it. We have big problems folks. Hope it can be corrected. Bob Ashpole, February 7, 2018 at 6:04 p.m.
Everyone agrees that improvement of the player development and identification process is called for, although some think the system is not completely broken. It is seeing the need for change that is important. Tab Ramos giving scouts a model player to look for is part of a solution, not a problem. Tab Ramos is part of the solution, not a problem. He is also front runner to be the next MNT coach. I personally will be upset if it is not him or another US coach from his generation of comparable experience. For long term success we must focus on building rather than winning friendly matches. Back to the scouting player model, this is a reflection of the model player that we are trying to develop. I don't buy the idea that the model player is tied to selection of a playing style, because I strongly believe that we need to develop players who can play all styles and all systems. That is not such a wild idea because it simply requires mastering the fundamentals. My personal coaching philosophy was that I was developing players to play total football at the senior level, i.e. capable of highly effective play after interchanging between lines. I strongly reject the concept that players are "right backs" etc. Positions depend on systems of play. Style of play and systems depend on game plan. Who a coach assigns to a position depends on who is on the team. Assignments are not about picking the strongest player at each position; it is about picking the strongest team. What is a "right back" going to do if the coach choses the 352? frank schoon replied, February 7, 2018 at 7:55 p.m.
Bob, what is the scouting player model ? The very fact you state 'model' means you follow something to model after. All players can't play all styles and models that is why clubs buy and scout certain players to fit their STYLE and Personality of how the club plays. Ajax only picks certain types of wingers to fit their style of play, thus the Ajax scouts know what to look for in a winger when looking for wingers, to fit their style. Not all wingers can play the Ajax style, even though they have mastered the fundamentals. All players have weaknesses and strengths, regardless if they have mastered the basics. It is up to the coach to fit the players together in a manner that camouflage their weaknesses and allow to play most efficient and effective within the style you choose to play. You change the style than you change the make up and dynamics of the team. Each player has certain individual qualities, and it is unrealistic to say go play this style because you have mastered the fundamentals. You need a plan, a style you want to play, and you pick the best players that can best fit this style. Total soccer does not mean all players can play all positions and style. For Example, on the Dutch Team WC'74, you will never see the centerhalf go out and play wing because he was not a good 1v1 player. Or for example, the libero on the Dutch team had to come up to midfield, not all Liberos are able to come up to midfield but are more comfortable playing behind the defense, even though both types of liberos are technically fundamentally sound.Without choosing a style, than there is no direction of how you want to play, and specifically choose the kind of players you need, even though they all have mastered the fundamentals. Bob Ashpole replied, February 9, 2018 at 7:10 a.m.
Maybe this explains my thinking about youth development. I think there are only 5 positions (only 5 different skill sets) for development purposes: keeper, wide players, centerbacks, centermids, and center forwards. Identifiecation of 10 year old talent for development and identification of senior players for a club or nations first team are different. Our goal for 10 year olds should be to make everyone of them superior in every aspect. We of course are not going to succeed, so then we deal with the actual state of things as the years progress. Finally at the senior level players will be best suited for particular positions. Take wide players. Ideally they should all be able to cross. How well they cross compared to other available players determines where the coach places them. Some players are effective at all three lines (FB, halfback and winger) and and some are effective on both sides. But initially in development we should start by giving them the fundamental skills and tactics to attack and defend effectively on both sides. Perfection should be the goal even though perfection is out of reach. frank schoon replied, February 9, 2018 at 10:24 a.m. It is interesting but Janny van der Veen my youth coach at Ajax had the foresight to place youth players like Suurbier , who in his youth played as a rightwing, was put as Rightback and ended up for Ajax and WC'74 dutch as right back, likewise Ruud Krol who played wing in his youth was place was placed as leftback in his senior year, ended up playing for Ajax and WC'74 leftback. Also Hulshoff the centerfullback played most of his years as a centerforward. In fact the whole backline of Ajax were former attackers, and the libero was always attacking midfielder. So, in fact, no real defenders in the backline. Realize the crosses from the backs coming up came from former wingers who are excellent at crossing the ball and this is one of the reasons the crosses from the flanks today are LOUSY, lacking good placement, and proper touch all due to improper players executing the crosses. So many other great players, also began as wingers. The great Bobby Charlton, Beckenbauer, Puyol, Alves, Alba, Frank De Boer, Bergkamp, Van Persie,etc, all began as wingers. Today, we look at backs as players that make run downs the flanks and give the ball a "whack' for a cross..
frank schoon replied, February 9, 2018 at 10:54 a.m. There is a great anecdote about Johan Cruyff at the WC'74. It was here during half time where players realize what a genius Cruyff was. Michells made a substitution and Cruyff right away told everyone, who didn't see anything wrong with the substitution, what is going to happen to each one of as to howtheir play will effected by this particular substitution. They realized ,at that moment, who the real brain was. So many coaches have no idea and are unable to see the resultant effect of how one player can have on the team when substituting. Bob Ashpole replied, February 10, 2018 at 8:26 a.m.
Frank I agree that most players feel more comfortable in a position that suits their personality. For me it was midfield and combination passing. When I played competitively though, it was mostly at left wing (a lot of 1v1 and dribbling). As a development coach I felt it important to push players out of their comfort zones. frank schoon replied, February 10, 2018 at 11:53 a.m.
beautiful game, February 7, 2018 at 6:45 p.m. Problem is with the selection process of players. If they can do the job sign them. If they need to learn their job, have someone else teach them. I'd rather have all around players with a solid Soccer IQ, than specialists who can do one or two things and can't bring it to the table when it counts. It's all about execution and nothing else. Look at Barcelona's disastrous 2016 additions: Gomes, D. Suarez, Digne; none of whom have sufficient Barca DNA. They are a team liability on the pitch. They are fully developed players and cannot deliver the expected goods. Right Winger, February 7, 2018 at 8:32 p.m. Coaching at the MNT level isn't our problem. You have to assume we will get someone who is savvy. Our problem is at the youth level and yes I am talking about the coaching at the younger NT brackets. The coaching is pitiful. Their ability to identify talent is questionable at best. Technical ability of a player is secondary to being big strong and fast. That is evidenced by watching the men play and the poor touch they have when receiving a pass and when trying to properly place a pass. When we get to international competition we can't demonstrate basic ball control and it's over. Bob Ashpole, February 10, 2018 at 8:45 a.m.
My belief is that the road to national team success does not require widespread improvements in grassroots soccer and huge play to pay systems and national tournaments. Other countries have succeeded internationally with players selected from only 2 domestic professional clubs. Example Real Madrid and Barcelona for Spain and Ajax and Feyenoord for the great 1974 Netherlands team. So superior soccer is only needed at as little as 2 professional clubs with local youth soccer to provide raw talent. It also doesn't take many years to turn an average club team into an elite professional club. What it does take is exceptional coaches in charge, both developmental and first team, to develop the players and the first team. Prime example is the transformation of Ajax from 1965 to 1974. Barcelona is another success story.